I recently caught up with a friend from Maine, where the ground regularly freezes to 6' deep and footings for walls need to be poured 8' deep to get below the frost line. Makes our winters here in Palo Alto seem positively tropical, and even though the recent frosts are sending lots of things rushing into dormancy, there's still plenty to do in the garden. Your roses may still look like they're ready to party, but it's really time for them to rest a while. Stop feeding and watering them in advance of pruning them next month. Ditto your ornamental grasses, which will hold the frost and morning dew beautifully if you leave the seed plumes on just a bit longer. When you see them putting out new growth, that's your cue to cut them back "hard" — about 6" above the ground (till they resemble hedgehogs or sea urchins). Your fruit trees should have lost most of their leaves by now. 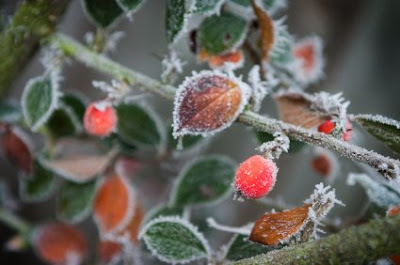 Once they're bare, it's time to prune them, remembering to leave plenty of fruiting spurs. If you're growing peaches, nectarines or apricots, spray with a "dormant season" spray while the weather is dry to prevent leaf curl and discourage insects. Hopefully you got all your daffodil and narcissus bulbs in a couple of months ago; now it's time to pull the THC (tulips, hyacinths and crocuses) out of the fridge and plunk them into the soil as well. Because the Bay Area isn't Maine, these bulbs don't go into deep dormancy, so I like to treat them as annuals and pack them into pots. Speaking of annuals, nurseries are brimming now with cool-season annuals such as nemesia, ornamental kale, and winter veggies. Now that the Christmas trees are gone, you'll also find a nice selection of camellias in bloom, and bareroot roses will be making an appearance shortly. For all of these I really like Regan Nursery, over in Fremont; Roger Reynolds (in Atherton) and Redwood City Nursery also feature excellent selections. Finally, it's a prime time to lay down an inch or two of organic compost throughout the garden. I don't bother tilling it in, mostly because I'm lazy but also because I have faith that the coming rains will percolate all the good stuff down without my help. Getting back to normal after the holidays can leave us a little time-challenged, but try to steal a few quiet, cool, sunny afternoons to spend in your garden before winter rains turn it into a muddy mess. Your landscape will thank you for it!